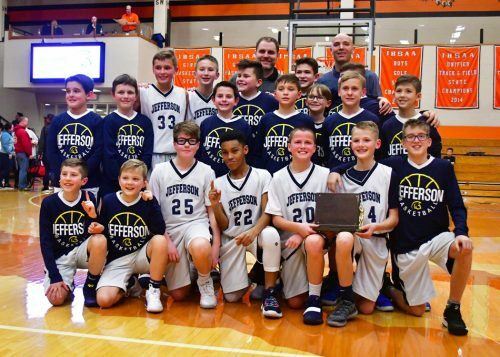 WARSAW – The 2019 version of the Warsaw Elementary City Basketball Championship had a pair of Jefferson teams assert themselves in the second halves to win each of the girls and boys championships Monday night. 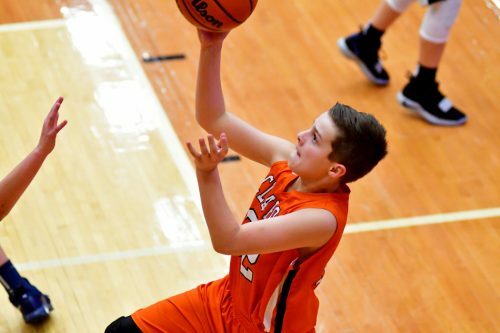 In front of a huge crowd at the Tiger Den at Warsaw Community High School, future Tigers played for bragging rights for their schools. And in each case, Jefferson is bringing home the chatter boxes after sweeping the showcase contests. 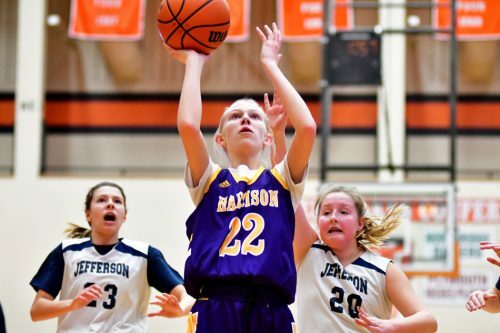 In the first game, Jefferson’s girls withstood a low scoring first quarter to pull away in the second half over Harrison. In the nightcap, Claypool couldn’t hold onto an early lead as Jefferson’s boys rallied to win the hardware. 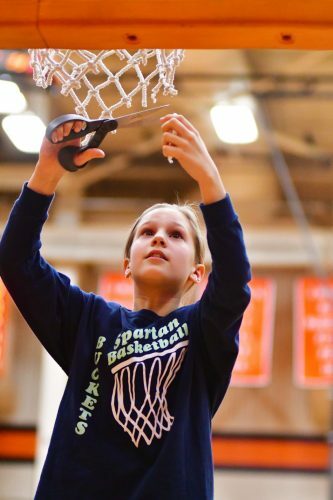 Lily Hotchkin cuts down the nets for Jefferson. A lethargic first quarter saw both clubs struggle to find its form as the lids were on both baskets pretty tight. A 4-2 lead by Jefferson, however, would spread out to 12-5 by the half. 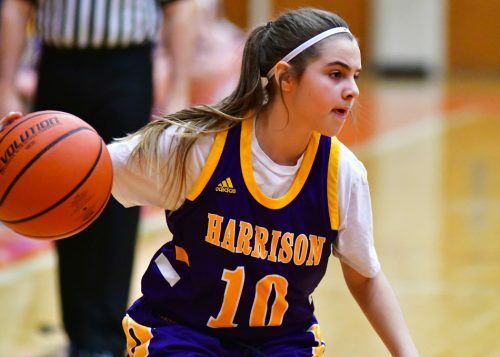 Abbey Peterson would hit a 20-footer midway through the third quarter, and at 18-5, the game was all but academic as Harrison couldn’t get anything going on its offensive end to counter Jefferson’s attack. Mia Jones hit a sweet reverse layup to highlight the fourth quarter, part of her 14-point night to lead all scorers. Jones also had 10 rebounds and four steals. Peterson finished with eight points, seven rebounds and five assists and Joslyn Bricker contributed four points and five rebounds. 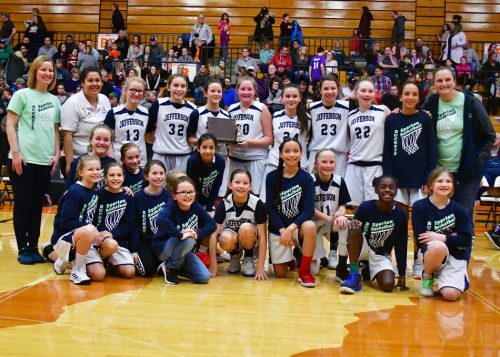 Harrison’s offense never got going, shooting 5-33 from the floor for the night with Gwen Howard the only Husky to make more than a bucket, ending with four points and five rebounds. Brooke Winchester tossed in seven rebounds. Jefferson, which beat Harrison by 18 during the regular season, finishes 10-1 overall and were 7-1 in the city standings. Harrison winds up 9-2 overall and were also 7-1 in the city standings. Claypool’s Kaleb Kline takes a running jumper against Jefferson. Claypool, playing for a shot at its first-ever City Championship, looked early on like a team with nothing to lose. Taking a stunning 12-3 lead, not only did the Knights have a groundswell of momentum, but had Drew Sullivan and his Spartan teammates on their heels. 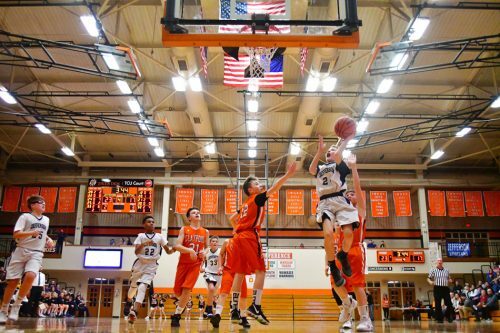 But the lead would evaporate by the third quarter, as Luke Bricker took over. 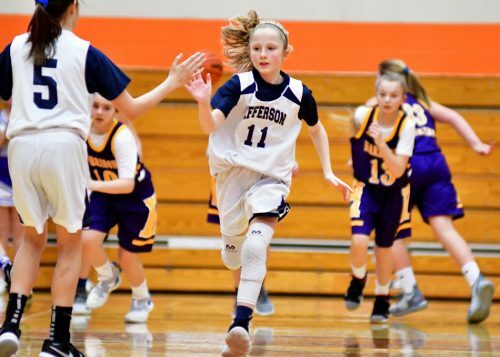 With the talented Sullivan on the bench with four fouls in the third quarter, Jefferson went on a 10-2 run, helped along by five points from Bricker. 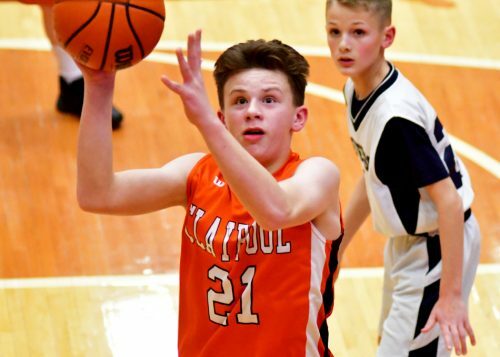 Kaleb Kline would hit a shot to pull Claypool within two at 23-21 in the fourth, but Bricker then scored the next six points on a layup and four straight free throws to ice the title. Bricker ended the game with 13 points, three rebounds and was a perfect 5-for-5 from the free throw line. Wyatt Dawson hit a pair of big shots during Jefferson’s rally in the first half and wound up with six points and four rebounds. Elijah Wright added four points. Kellan Bailey led the Knights (9-2, 7-1) with 11 points and six rebounds. Kline finished with eight points. Claypool was trying to avenge its only loss in the city standings, a 21-point setback to the Spartans in week six. Jefferson ends its 2018-19 campaign undefeated at 10-0. 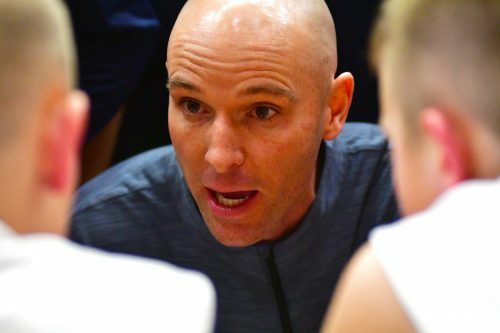 Coach Bricker was pretty excited to finish the job the girls started in game one, bringing both titles back to the corner of Jefferson Drive and Kings Highway in Winona Lake. Joslyn Bricker gets a five after a made basket. Gwen Howard rises for a shot for the Huskies. 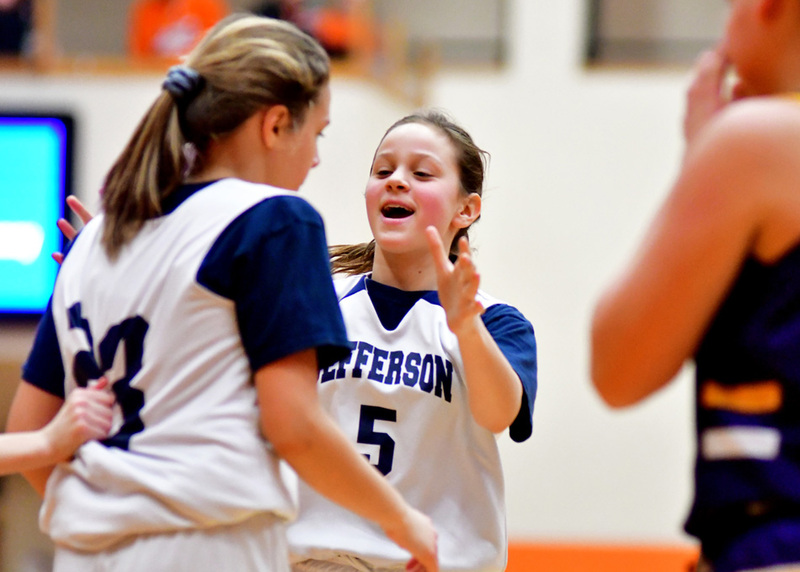 Remy Donovan works for Harrison against Jefferson. Coach Ryan Bricker addresses his Spartans before the opening tip. Jefferson’s Luke Bricker drives in for two. Claypool’s Kellen Bailey works for a shot.